It’s 12.25 and we’re headed for a road that the men’s lifestyle and driving mags rave about; The Amalfi Coast. 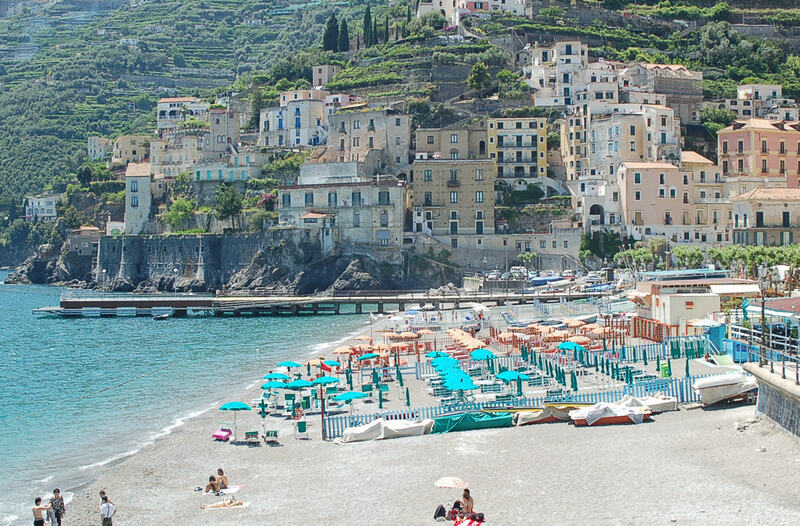 Amalfi, Porto Fino, Sorrento – playgrounds of the rich and famous. The Amalfi coastline – just stunning. Exoctic plants like the lava rock. 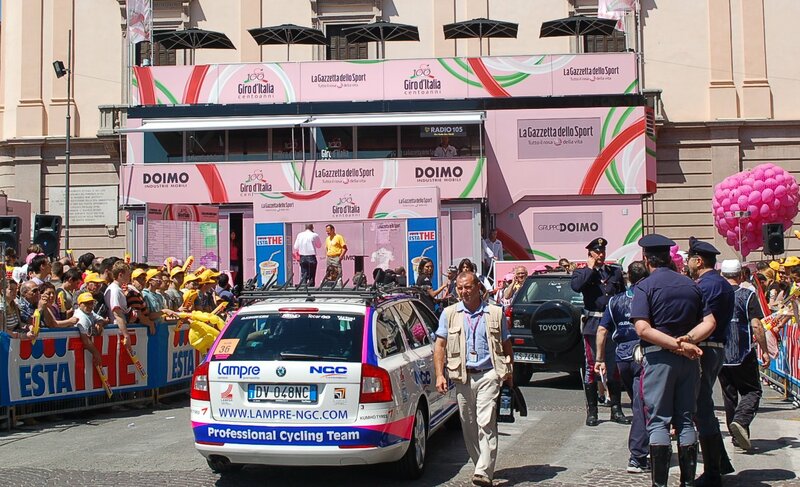 The stage today is the last big bare knuckle battle; Di Luca’s last chance to unseat Menchov. It wouldn’t be a grand tour without a protest. And here we are; 21:47 in the bar of the Hotel Ideal in Naples, sending our pics for the day. I was close to a rant, we phoned the Hotel Ideal, “yes, we have wireless in the bar.” Sounded good to us! The Amalfi was beautiful, spectacular, it would be best to spend a couple of days there, take it all in. A couple of minutes would do for Naples; we’d heard that it wasn’t braw, but we were unprepared for just how unbraw it was. Around the corner from where we are, the prostitutes are lined up, the drug dealers stalk and street traders lay out second hand clothes – and rake skips – it’s like a Third World city. The view from the hotel balcony is cool if you’re into construction, depressing if you’re not. The traffic is horrific, it took an age to get off Vesuvio and down to the digs – and it doesn’t stop; there’s been a wall of noise out there, all night. The Amalfi was glorious and the road along past Sorrento was nice; but once we arrived in Torre – part of Greater Naples, things went downhill, rapid! The roads were terrible, the fans were not to be messed with and the whole place looked generally run down. The police had patently lost the plot on crowd and traffic control and we were glad to get out of the place and up on to Vesuvio. Tom Lovkvist has had a solid Giro. It may be a hard climb, but it’s not a particularly spectacular one – due to the lay of the land, there aren’t that many great views, not from the heights we reached, anyway. It would be an interesting place to go, if you had time to do a little homework and scraping about – the lava flows with their wild flowers look amazing. The capo’s pretty much stuck together, despite Di Luca’s frenzied-out-the-saddle efforts. The race didn’t go as we’d all hoped – that was Di Luca dropping Menchov – but respect to Carlos Sastre. Di Luca has been digging deep, whilst Menchov has been solid and measuring his efforts in defence. Menchov looks to have it in the bag. Barring accidents, acts of God (and ‘positifs’) the overall is decided. Today is a transition stage; the parcours aren’t too dramatic but the finish is sore, too sore for the pure sprinters, they say. The grupetto, with our pal Dario at the tail. It’s most likely to be a break today, riders who aren’t too tired and whose DS’s have coaxed or bullied them into a move. The irony is that it will probably be one of the teams who have already won a stage and aren’t under pressure. 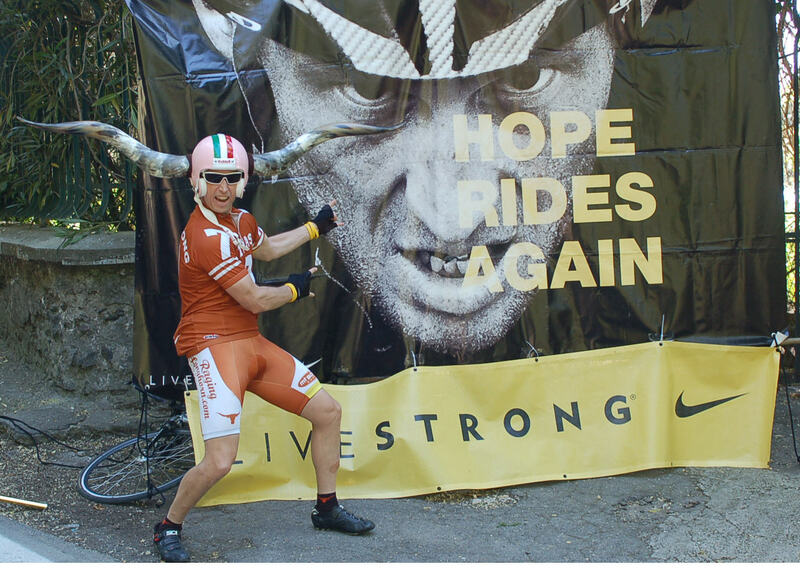 Today saw us achieve a mission objective; we caught up with the “colourful” character with the horned helmet, who runs up the climbs beside Lance. After chatting to us, Long Horn will be at the race tomorrow. Sorry Viktor. When I say achieved a mission objective, maybe not quite, what Viktor briefed us on was to run the boy over; we settled for a chat, bearing in mind the defamation laws, I’ll say no more. Except that Dave wishes to disclaim any involvement in the matter. Nearly breakfast time, best get a shower.